It was a battle of the sexes at the Adidas Fluid Trainer Flexibility Face-Off! Held at True Fitness Suntec City on Saturday 18 September, male and female participants pitted against each other to determine the most versatile gym-workout team. To kick off the challenge, True Fitness instructors held quick warm-up and stretching exercises for the teams. 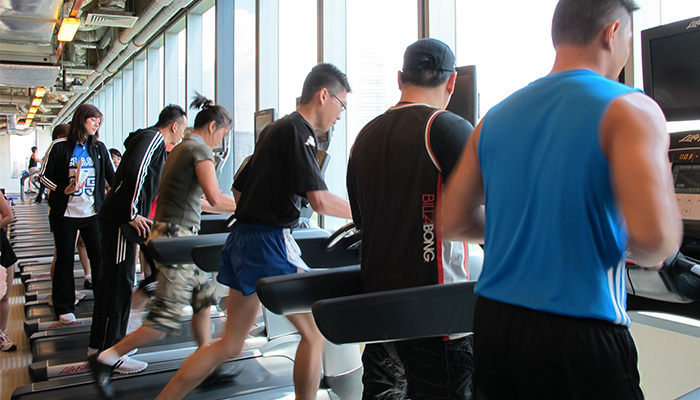 The fitness centre was abuzz with excitement as the teams started up the challenge at four fitness stations. For the 2nd year running, in support of women’s health and fitness, True Fitness was the Official Fitness Partner for the Great Eastern Women 10K Run 2010. 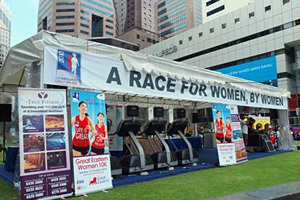 An annual running event for women in Singapore, the Great Eastern Women 10K is one of the largest women only running events in Asia. In the lead up to Race Day, True Fitness put together a series of activities for the participants to help them better prepare for their run. To kick off registrations for the event, the Race Launch Roadshow at Raffles Green on 21 July 2010 was a hive of activity with four all-women teams running 1km each on treadmills sponsored by True Fitness, all in support of the Breast Cancer Foundation. The Suntec City Fountain of Wealth was an explosion of activity with more than 400 participants at Singapore’s largest outdoor BodycombatTM event. Despite the early morning rain, this did not dampen the enthusiasm as evident by the good attendance and infectious, high energy mood. This year’s theme, entitled “Work out with the Stars” was graced by True Fitness’ brand ambassador - Andrea Fonseka, celebrity DJ Cheryl Miles, and FLY Entertainment artistes Bobby Tonelli as well as Tracy Tan. At this True Fitness’s signature annual event, they kicked and punched along with the participants in an hour long mass BodycombatTM workout.